The portrait by an artist still unknown was probably done circa 1755. Although the artist is still a mystery as the painting is not signed some information on its history has been uncovered. This portrait purchased circa 1999 from an antique dealer in Seattle Washington USA, was at that time was so dirty that it could only be guessed that it was in fact a woman. The painting was owned by James Johnston of Alexandria Virginia in 1851. 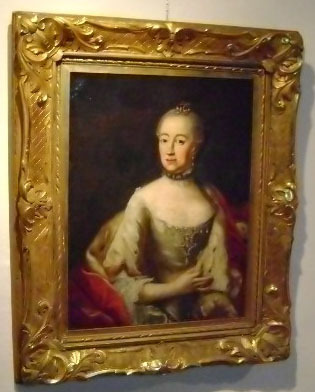 I believe it is a portrait of Marie Leszczynska wife of Louis XV king of France. Size is 64cm x 84cm with the frame 97cm x 117cm. The frame is 19th century, american in manufacture. The stretcher bars were replaced by the professional restorers in France. It weighs approximately 20 kilos (45 pounds) mostly due to the frame. When this painting was purchased many years ago it was in a very dirty condition. The painting was also lined twice. The painting has been restored to remove the lining canvases and is now unlined. For those who don’t understand the concept of lining, The original canvas when it becomes fragile or torn is glued to another more solid canvas. In this case to two other canvases, making a three layer sandwich, one prior to 1851 and one after 1851 probably circa 1890’s but certainly before 1920. It was hoped that some information would be found on the back of the original canvas but there was nothing. As almost an afterthought I decided to have the two liners separated and on the back of the first lining was the following delivery information. Research reveals that Stephen Shinn, a shipping agent operated a large business on Janney’s Wharf. Rev. Johnston was a man of independent means. A native of Savannah, he was a Yale educated attorney who came late to the priesthood. He was rector of St. Pauls Episcopal Church from 1833 till 1859. His wife, Jane Sanford, was a native of New Jersey. Her sister, Harriet, married the second Julius Adolphus DeLagnel (Capt. Second Seminole War). J.A. DeLagnel died in 1840 and is buried in St. Paul’s Cemetery in Alexandria. Mrs. DeLagnel and her four children (Julius, Johnston, Julia, and Louisa) resided with the Johnstons. Louisa died of a self inflicted overdose of arsenic in 1850. Around 1852 Rev Johnston had a large house built at 806 Prince Street. The painting would have been one of the original furnishings of this house. The Johnstons, southern sympathizers, abandoned the property when the Union secured the city in 1861. The house became the Union’s Prince Street Hospital. The house was sold for taxes in 1864. In a very unusual move, Rev. Johnston was able to repurchase the property after the war. In 1875, he transferred title to Col. Julius DeLagnel. The house stayed in the family until 1903 when it was sold to the R.E. Lee Camp #2 United Confederate Veterans, they sold it to the Daughters of the Confederacy in 1924 and it now houses a Confederate War Museum! The Delagnel family of Alexandria is well known in American History. The family of originally french minor nobility moved to Haiti in the 1700’s but left Haiti during the slave revolts in the late 1700’s or very early 1800’s. There appears to have been 3 different Julius Adolphus DeLagnel, one in each of 3 generations. The first 1744-1810 is buried in Alexandria. The second 1799-1840 was one of the first graduates of West Point and served in the Second Seminole War in Florida as a lieutenant and later as Captain. The third (1827-1912) also went to west point and served in the civil war for the Confederacy climbing in rank to Brigadier General. Hero of Rich Mountain, In 1850 he is a 1st. lieut. stationed in Miami. Julius’s brother Johnston DeLagnel was a Major in the confederate Artillery who died in 1864. He is listed on the Confederate War dead monument in Alexandria. In summary When the house at 806 prince street was built and furnished the residents were James and Jane Johnston, Hariett Delagnel, her daughter Julia Delagnel, her son Johnston Delagnel (future Major CSA), And her son Julius Adolphus Delagnel (future Colonel CSA). Both the sons in the military were of course posted away from Alexandria. The 1850 census of Alexandria confirms this. We can well imagine that the painting would have been seized by federal forces in 1861 but I think more likely that the furnishings were moved and stored by the family as they obviously retained their fortune through the war and were able to repurchase the house after the war. In 1875 the house became the property of J. A. Delagnel. Rev. Johnston lived in the house until his death in 1877. Then Mrs. Johnston and Mrs. DeLagnel lived there until they died in the early 1890’s. She left everything to Julius (all her other children had died–the Johnstons had no children). Julius left everything to his third wife. She left her estate to various relatives. She does seem to have been very much into the art scene in Washington, DC. Brig. Gen. Julius A. de Lagnel (b. 1827, d. 1912) Not many men would pass up a promotion to brigadier general. But Julius Adolph de Lagnel was one of those men. Born near Newark, New Jersey, July 24, 1827, de Lagnel received a commission into the U.S. Army in 1847 as a second lieutenant of artillery. He was promoted to first lieutenant in 1849. Somewhere along the line, de Lagnel had moved to Virginia. In 1861, he resigned his U.S. Army commission to take a commission as a Confederate captain. On the staff of Brig. Gen. Robert Garnett, de Lagnel was chief of artillery in defense of the crest of Rich Mountain, July 11, 1861. There, he led the defense with just a few companies of infantry and one cannon against four Federal infantry regiments and one cavalry regiment led by Brig. Gen. William Rosecrans. He was the last man operating the artillery piece when he was wounded. Hiding in a thicket, de Lagnel escaped capture and recovered in a nearby residence. He later was captured while disguised as a herder while trying to return to the Confederate lines. After about a year in Federal captivity, de Lagnel was exchanged. He received a promotion to brigadier general to rank from April 15, 1862, but turned down the commission. He then took a post in the Ordnance Bureau in Richmond. He did accept a promotion to lieutenant colonel. Operating as second in command to Brig. Gen. Josiah Gorgas, de Lagnel spent the rest of the war in this role. He also inspected arsenals around the Confederacy. After the war, he was a businessman engaged in the Pacific steamship service. He died in Washington, D.C., June 3, 1912, and was buried in Alexandria, Virginia. I have been in Contact with the current owners of the house (UDC) and they would be delighted to have the painting but as a nonprofit organization have no funds to repurchase the original furnishings.